STARRING John Kani, Robert Pugh, Sir John Gielgud, Robert Hardy, Stephen Fry, Rachel Dowling, Dudley Sutton and Anita Dobson. 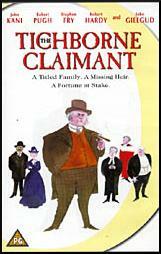 SYNOPSIS Based on the true story of a Tichborne's claim to a family fortune during the late 19th century. Lord Tichborne, the ninth richest nobleman in England, disappears in a shipwreck. Years later, his mother refuses to believe him dead and sends family servant Andre Bogle to Australia, where Tichborne is rumoured to have survived and settled. Bogle finds a claimant and brings him back to England. There the family accepts him and his claim to the family position and fortune. All seems to be well, until the death of Lady Tichborne. A long court case follows as the claimants identity is attacked and defended.